Each year around 551 million chickens are slaughtered in Australia. 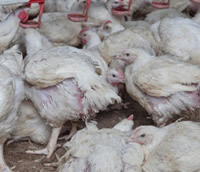 Chickens are the largest number of intensively farmed animals in Australia and also have the shortest life of all animals kept in intensive meat production. Rapid growth causes skeletal and metabolic disorders causing suffering, lameness, pain and death. 90% of chickens have a detectable abnormal gait at the age they are slaughtered. Animal Liberation has footage from day old chicks to broilers ready for slaughter, revealing the lifelong suffering of these animals and a drastic weight difference to rescued chicks at slaughter age. The regulating authorities have failed to advocate for these animals. We see it as our duty to assist and protect these animals by documenting evidence of their suffering and to show the public the truth of what is happening behind these shed walls, to put pressure onto the regulating authorities to act to end this suffering.